In this scenario you&apos;ll learn how to get started with Angular 4.
define a single page Hello World app. The commands are run in a Docker host environment, so you do not need to install anything locally. Instead, you can run all commands in a console within an Internet browser. This scenario has started a Jenkins Docker container to configure and run Jenkins Pipelines. With an example project that is throwing random unit test failures, we have demonstrated, how to create and display a test report trend graph. Coming soon: Learn how to automatically trigger a Pipeline workflow with our triggered pipeline scenario. We will prepare an environment with a Jenkins server running as a Docker Container. Note: steps 1 to 3 can be skipped, if you want to head directly to the pipeline section. We will provide a pre-configured Jenkins image in step 4.
docker run -d -u root --rm --name jenkins \ -p 8080:8080 -p 50000:50000 \ --entrypoint bash \ jenkins:2.46.2-alpine \ -c "tail -F /jenkins.log"
You can load the Jenkins&apos; dashboard via the following URL https://[[HOST_SUBDOMAIN]]-8080-[[KATACODA_HOST]].environments.katacoda.com/ or by clicking the dashboard tab on the right (note: sometimes, you need to wait a few seconds and press "display port" at this point). In the next steps, you&apos;ll use the dashboard to configure the plugins and start building Docker Images. You can load the angular application on the dashboard or via the following URL https://[[HOST_SUBDOMAIN]]-8080-[[KATACODA_HOST]].environments.katacoda.com/ or by clicking the dashboard tab on the right (note: sometimes, you need to wait a few seconds and press "display port" at this point). In the Dashboard or the Browser, where you have opened the Client, "Hello Angular" is automatically exchanged by "Hello World". There is no need to reload the browser manually. You just need to wait for some seconds, depending on your Internet speed. To toggle back and to &apos;Hello Anglar&apos;, you can issue the command sed -r -i &apos;s/World/Angular/g&apos; src/app/app.component.ts . Once the plugins have been installed, you can configure how pipelines uses Git and Maven to download and build a hello world application. This step configures the Maven plugin. Once again, select Manage Jenkins. 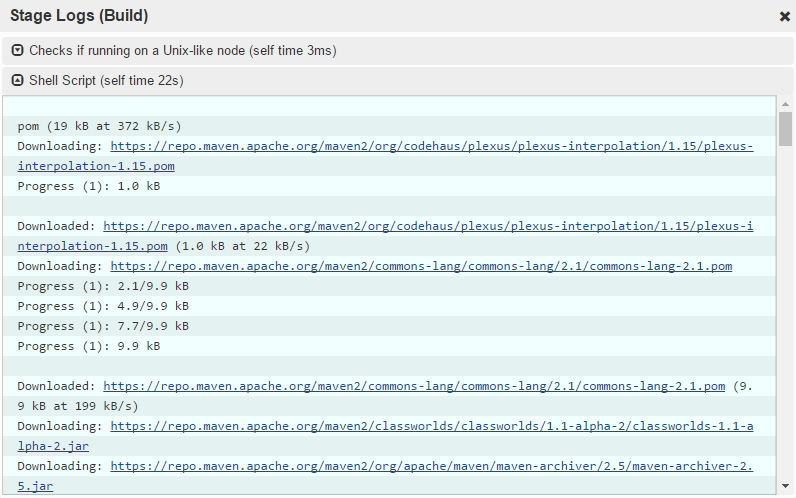 At the bottom, there is a button called Maven installations.... Click it. Click the Install automatically checkbox and keep the option Install from Apache with version 3.5.0. This step configures the Git plugin. In the Manage Jenkins page, find the section Git -> Git installations -> Git. Keep the name Default and check the Install automatically checkbox. From the Add Installer dropdown menue, choose Run Shell Command. Copy the command which git || (apk update && apk upgrade && apk add --no-cache git) into the Command box. This command is valid for the chosen alpine image only and must be adapted for other Linux distributions. In the Tool Home box, enter /usr/bin/git. Jenkins Pipelines are now ready to use Git and Maven. We now will start a pre-configured Jenkins. You can skip this step, if you have accomplished steps 1-3 successfully. Download and start a pre-configured Jenkins container. You can load the Jenkins&apos; dashboard via the following URL https://[[HOST_SUBDOMAIN]]-8080-[[KATACODA_HOST]].environments.katacoda.com/ or by clicking the dashboard tab on the right. docker run -d -u root --name jenkins \ -p 8080:8080 -p 50000:50000 \ --entrypoint bash \ jenkins:2.46.2-alpine \ -c "tail -F /jenkins.log"
Perform the manual steps 1 to 3. Create a new container with the correct entrypoint and CMD: docker run -d --entrypoint "bash" -p 8080:8080 -p 50000:50000 --name jenkins2 newjenkinsimage -c "JENKINS_HOME=/jenkins_home_alpine java -jar /usr/share/jenkins/jenkins.war"
Here you need to exchange oveits by your own Docker Hub user name. 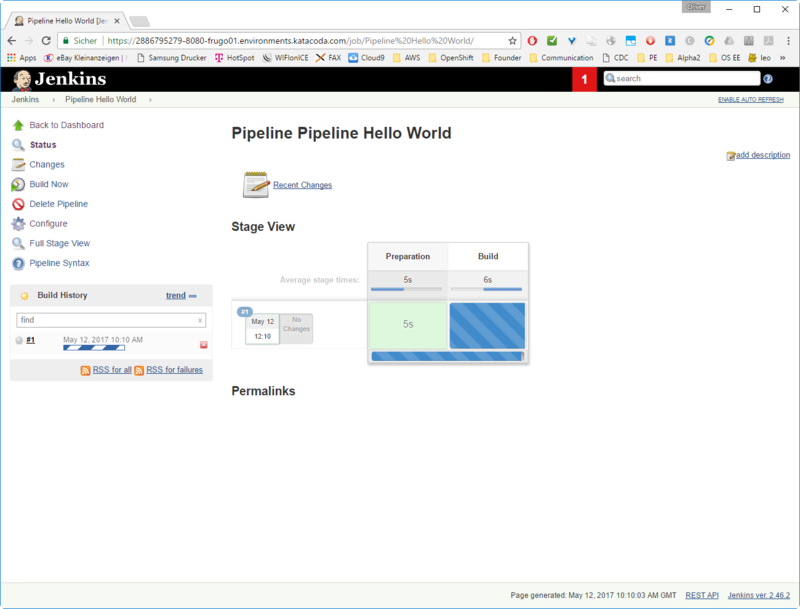 We now will create our first Jenkins Pipeline project. On the Jenkins dashboard, select create new jobs under the Welcome message or *new Item in the sidebar menue. Give the job a friendly name such as Pipeline Hello World, select Pipeline and press OK.
Review the Groovy code. You will see that we will use git for cloning a sample project and we will build the project using the Maven installation we had named "M3". In the next step, we will try it out. 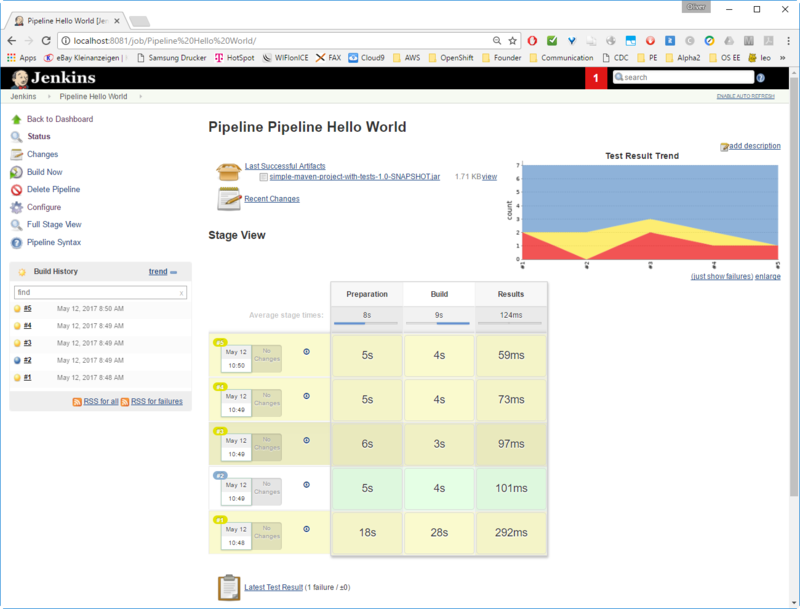 We now have a configured Pipeline job that will build our hello world software from Github. The next stage is to test and try it. On the left-hand side, select Build Now. You should see that the pipeline is starting. Repeat the Build Now several times. Some of the builds will be shown in green (stable), some will be shown in yellow (unstable). This comes from the fact, that the sample project we have chosen randomly throws errors, so we will get a nice Test Trend graph. If you have started Jenkins in a separate Window or tab, reload the page or press F5. In the dashboard, you need to click on the Job name "Pipeline Hello World" instead.